I like to think I'm an adventurous eater, but where brunch is concerned, I have an addiction. 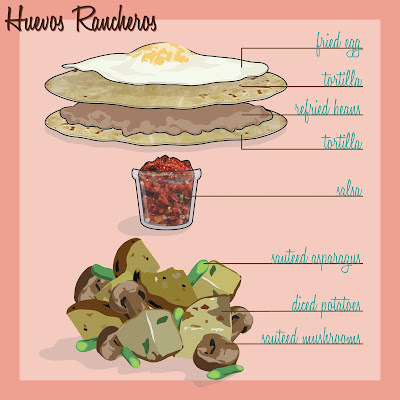 I love some huevos rancheros. The first time that I had the ol' huevos rancheros was at my favorite Astoria brunch spot, Cafe Bar, so I just assumed the dish was always made that way. However, I've ordered huevos rancheros all around the city, and apparently everybody does them differently. I've had huevos rancheros with crunchy tortillas, with sour cream and quacamole, made as a sort of soupy-looking omelet, and sort of served like tacos. The best, in my opinion, are the ones from Cafe Bar. They're just simple and delicious. While eating brunch at Cafe Bar yesterday morning, it occurred to me that if I, at some point, am spinstering far away from my spot, I may find myself in dire need of los huevos. I'll just have to make them myself. And above, you'll find how I think I'd go about copying the delicious dish from my favorite neighborhood hangout. But in case my little recipe graphic is somehow confusing, I'll write it out for you, too. 1. Warm your refried beans. 2. In a frying pan, place one tortilla on the surface, cover it with refried beans, and cover the refried beans with a second tortilla. Turn over a couple times until warm. Place on your plate. 3. Fry an egg to your liking - over easy or over hard. Whatever. Then place this on top of your little tortilla bean sandwich. 1. Dice some potatoes and sautee them with olive oil, salt, pepper, and garlic...and whaever else you want. 2. Chop some asparagus and add to the mixture. 3. Add chopped mushrooms and stir all together until warm and done. Voila! Your Huevos Rancheros a la Cafe Bar! Ok...let's be real here, I have no idea what kinds of spices and things they put in the potato/asparagus/mushroom mixture, but it is so tasty. I assume they cook that part first and then they do the egg. But until I discover the real recipe, I shall experiment, and so should you!